NEFW offers CAD service — Just give us the specs of your job and we'll create the CAD files for you. New England Fiberglass Windows (NEFW) is the exclusive distributor of Norwood Permaglass windows and doors in New England. Norwood Permaglass windows are manufactured from pultruded fiberglass, an ideal material for New England climates because it can withstand extreme temperatures and moisture. Permaglass windows also offer complete design flexibility and can be configured to replicate historical windows, combining beauty and efficiency. As historical renovation consultant, we'll work closely with you to meet the specifications of your job and create or duplicate the look and feel of your project. Although fiberglass windows are best for most restorations, sometimes exact duplication requires wooden windows that are historically-accurate. 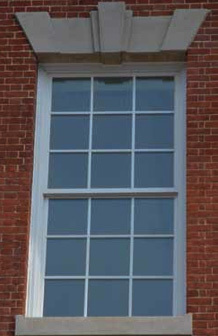 NEFW offers historially-accurate windows pre-assembled for quick and easy installation. NEFW is adding new products all the time. Soon we will offer a complete line of fenestration products including windows, doors, and storefronts. For jobs that require duplication of an exact historical design, we now offer historically-accurate wood windows. Watch for the introduction of our fiberglass storefront line. For more information, call 978.416.9495 send us an email.